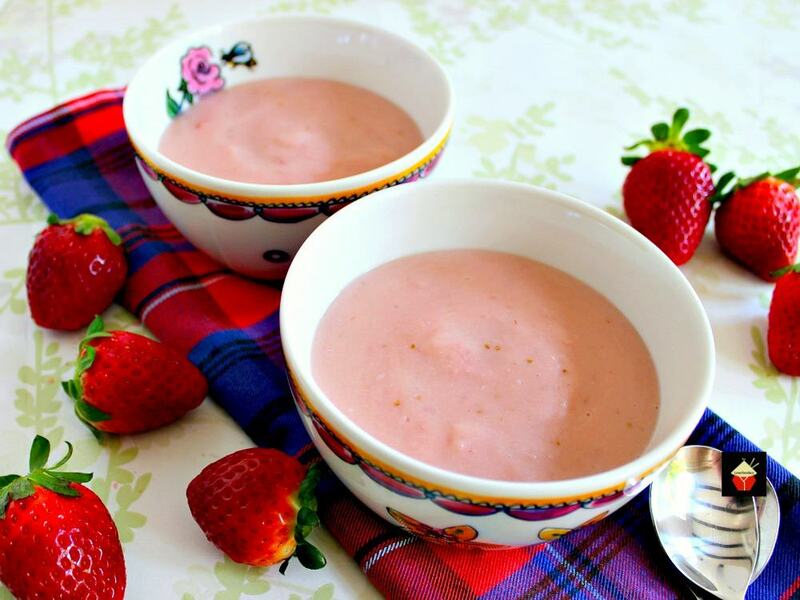 Homemade Strawberry Pudding is just so delicious! Homemade Strawberry Pudding! 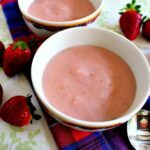 Gosh, there is nothing better than a creamy, smooth strawberry pudding, other than it must be homemade! If you’re used to buying the instant pudding mixes and then you try this homemade recipe, I am sure you won’t go back to those packets ever again! This is a quick and easy recipe, and uses regular ingredients which most of you will have in your pantry already. The trick to make this pudding smooth is simply to stir, stir, stir! If you leave it whilst it is cooking, you will end up with a lumpy mess, so grab your spoon and don’t forget to stir! In this recipe I have advised to taste the pudding as you are cooking for sweetness. Simply because everyone has a different preference.I have used fresh strawberries, so I tasted a strawberry first for sweetness, and then when I was making the pudding, tasted again to make sure I had added enough sugar. I have also not used any additives or colorings. You will notice in the packet mixes, the strawberry pudding can often be a bright pink color. This recipe is all natural and fresh! 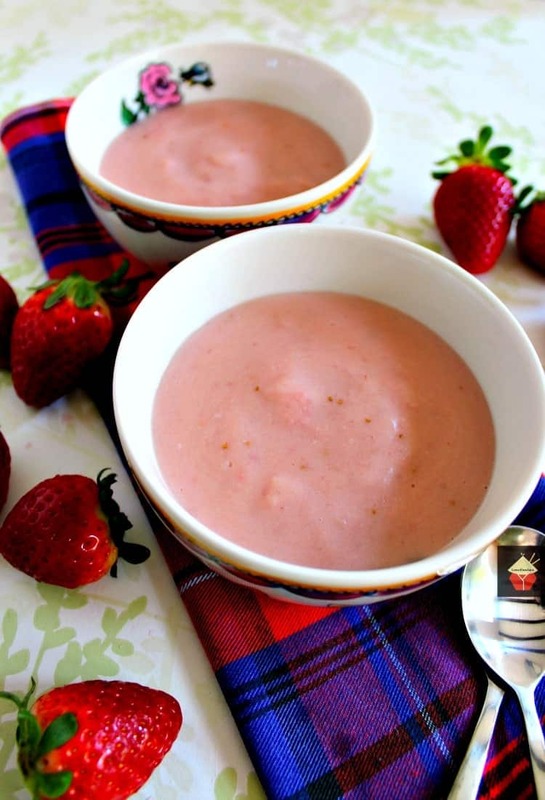 Strawberry pudding can be used for so many desserts. You can serve it hot or cold, use as a pouring sauce over a nice slice of cake or fruit cobbler, add as part of a chilled dessert, such as a trifle. Really, the sky’s the limit, so use it however you wish, and most of all, please enjoy! 1. 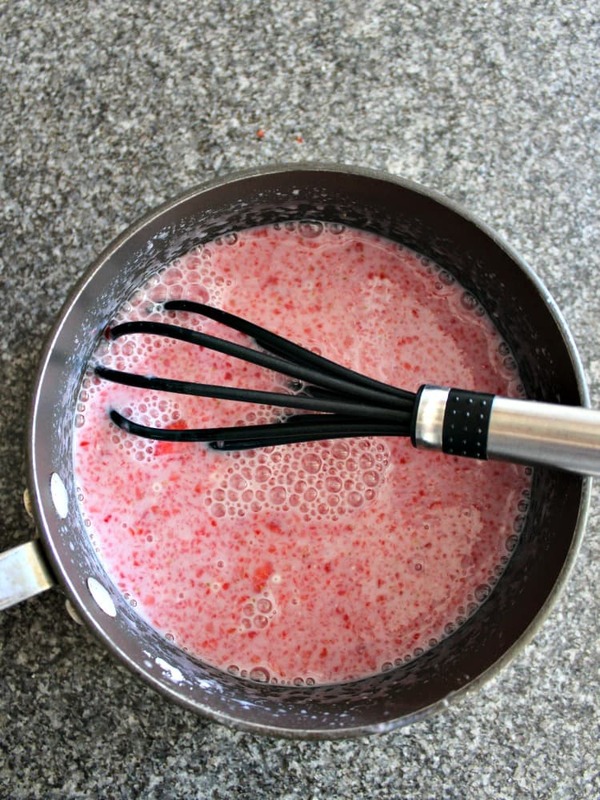 In a saucepan, add the sugar, cornstarch, salt, pureed strawberries and milk. Stir so there are no lumps and bring to a gentle boil, stirring all the time. As soon as it boils, remove from heat. 2. In a bowl, add the egg yolks and lightly beat. Then slowly pour in half of the milk mixture, stirring as you pour. Return the bowl mixture to the saucepan and bring to a gentle boil, stirring all the time then add the remaining milk mixture until it starts to boil. At this point, have a little taste to see if you have the amount of sweetness to your liking. If you need more, simply add a tablespoon of sugar at a time and taste as you go along. Remove from heat, add the vanilla extract, stir, then serve or transfer to a bowl to cool if desired. 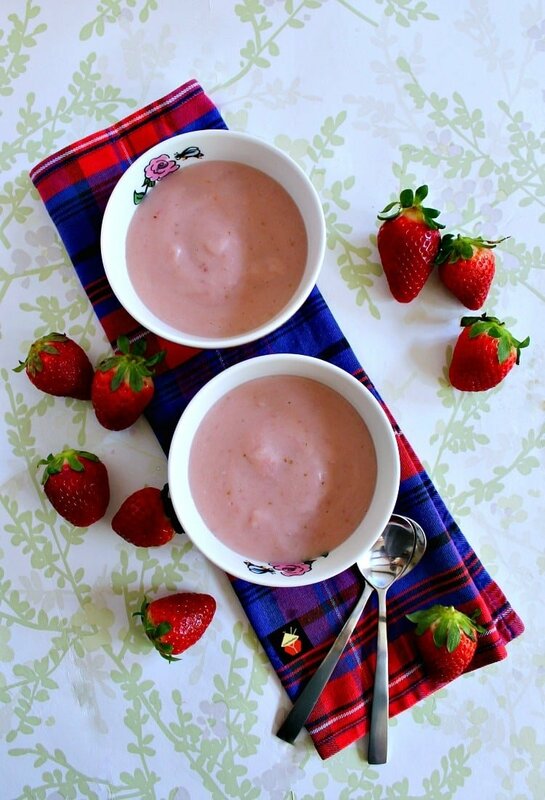 In a saucepan, add the sugar, cornstarch, salt, pureed strawberries and milk. Stir so there are no lumps and bring to a gentle boil, stirring all the time. As soon as it boils, remove from heat. In a bowl, add the egg yolks and lightly beat. Then slowly pour in half of the milk mixture, stirring as you pour. Return the bowl mixture to the saucepan and bring to a gentle boil, stirring all the time then add the remaining milk mixture until it starts to boil. At this point, have a little taste to see if you have the amount of sweetness to your liking. If you need more, simply add a tablespoon of sugar at a time and taste as you go along. Remove from heat, add the vanilla extract, stir, then serve or transfer to a bowl to cool if desired. It was a delicious pudding and it was really simple to make. And I had never made pudding before. Some of the changes I made was to cut the sugar by half as I do not like it sweet, and I also needed a bit extra cornstarch as it was a little thin. I strained the pudding mixture at the end to get rid of the strawberry seeds in the puree. This is a great recipe. I cut back on the cornstarch to 1-1/2 because I could taste it in my test batch. I also used half and half instead of milk and it was much creamier. I also used 8 oz. of purée. Hi Bethany, using extra cornstarch will work as a thickener, instead of the yolk, but I haven’t tried the recipe without the yolk so I can’t say how much extra cornstarch you need. I suggest adding a little cornstarch and water mixture when it’s heating up and testing for consistency as you go, and of course make sure the cornstarch is cooked through otherwise it will taste powdery. Quick question, when do I add the second half of the milk mixture in? Exactly what I was confused about. Sounds like a good recipe but I cant make it with the way it’s worded. Sorry you never got your answer. Hi Teresa and Paul, the milk mixture is all the ingredients you have heated in the pan in step 1. You need to add that to the egg yolks in stages otherwise it will scramble the eggs if you add it all at once. Indeed, easy to prepare and very delicious!!! It’s strawberry season!! I have made a little change after the first time. Instead of milk I used 1/2 milk and 1/2 home made coconut milk. So still all fresh ingredients. For the vanilla I used fresh vanilla beans (cut open) soaked for a couple of days in wodka. I’ve made your recipe for the seventh time and enjoyed every time!! That sounds wonderful with the coconut! !